﻿ The Style Examiner: Boa Mistura’s Vila Brâsilandia Project: Painting the Town Red (and All Other Colours)! Boa Mistura’s Vila Brâsilandia Project: Painting the Town Red (and All Other Colours)! 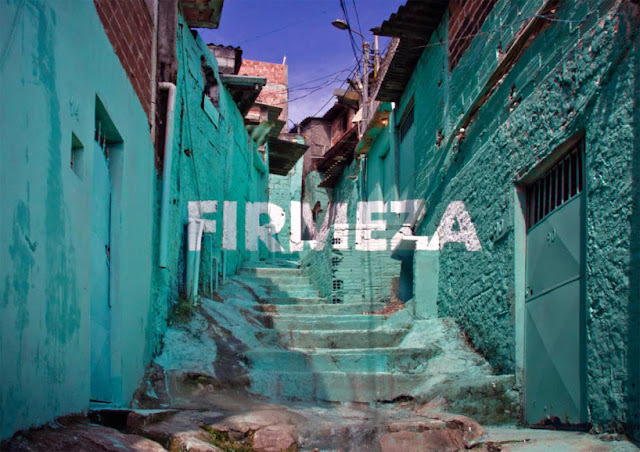 Spanish art collective Boa Mistura have unveiled photographs of their urban art project in Vila Brâsilandia, one of the favelas in São Paulo, Brazil. 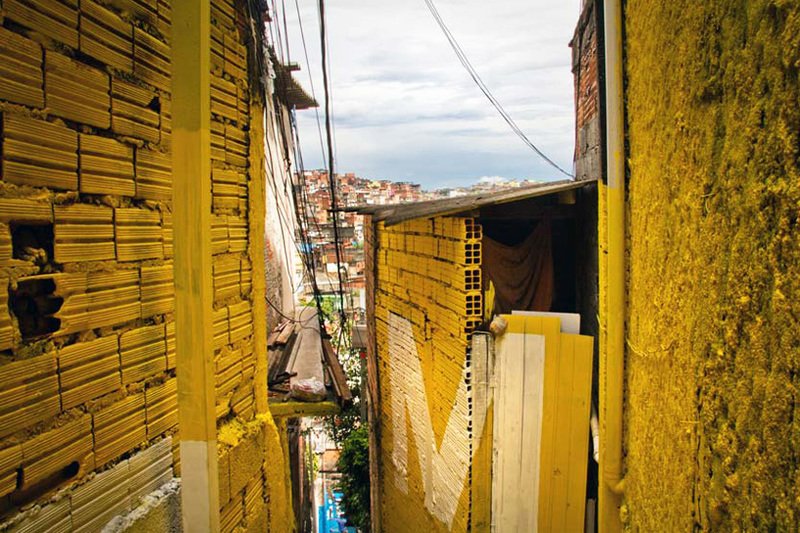 The five artists worked with residents to paint single words with uplifting meanings on the walls of the favela’s winding alleyways. 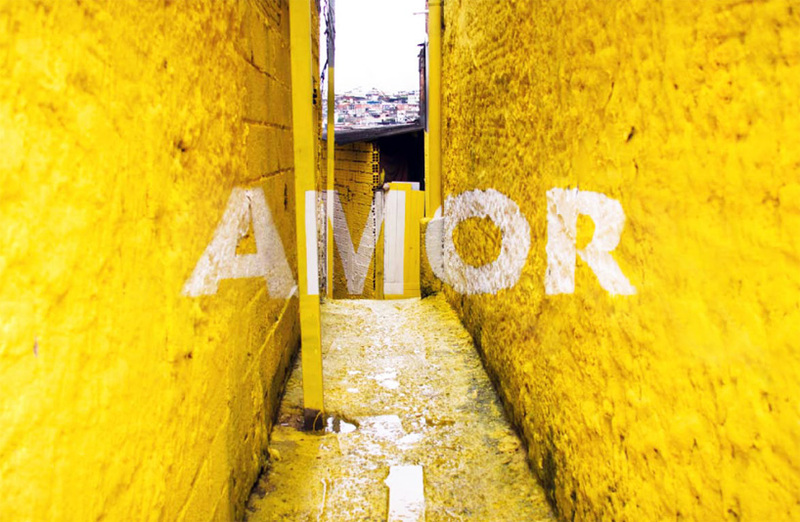 Viewed from a certain angle and distance, words like ‘Amor’ (“Love”), ‘Beleza’ (“Beauty”), and ‘Orgulho’ (“Pride”) seem to hang on the walls; however, owing to their three-dimensional positioning, as viewers move towards or away from them they become distorted. 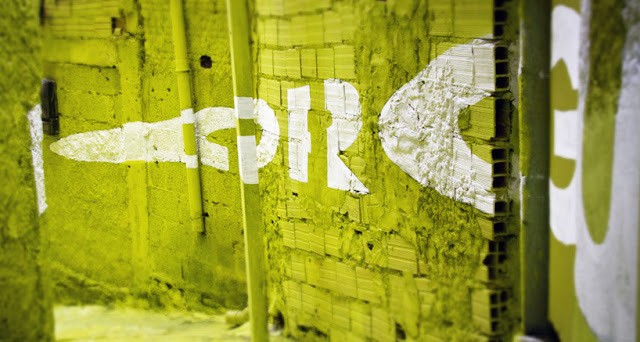 Boa Mistura (from the Portuguese for “good mixture”, a form of words chosen to refer to the diversity of style and perspectives of each member) was founded in Madrid, Spain, in late 2011, as a multidisciplinary group working across diverse fields: from the latest trends in graffiti and street murals, to illustration, graphic design, studio painting and collaborations with interior designers and architects. The collective comprises Javier Serrano Guerra (‘Pahg’), an architect from ETSAG in Madrid who specialised in landscape design at the IUAV in Venice, Juan Jaume Fernández (‘Derko’), a Fine Art graduate from the University of the Arts in Berlin who specialised in photography and video, Pablo Ferreiro Mederos (‘Arkoh’), who graduated in Fine Art from the TAIK University of Art and Design in Helsinki specialising in graphic design, Pablo Purón Carrillo (‘Purone’), an illustrator who graduated in Advertising and Public Relations from the URJC in Madrid, and Rubén Martín de Lucas (‘rDick’), a civil engineer graduate from the UPM (Polytechnic University of Madrid). Since they came to the fore, Boa Mistura have taken part in exhibitions in art galleries such as the Reina Sofía Museum and the Casa Encendida in Madrid, and the DA2 Museum in Salamanca. They have completed projects for brands such as Google, Microsoft, Sony Music and Adidas, and in 2010 received a Latin Grammy nomination for best cover design. They have also collaborated with foundations such as ONCE (Spanish national organisation for the blind), Oxfam and Antonio Gala, and given lectures at universities such as Madrid, Seville and Alcalá de Henares.